I purchased a home in Parkmont of Fremont (I wish I knew about http://www.tricityhome.com CA back in 99. It was built in 1978, so if you are like me and purchased a home built back then or even one built in the eighties, you may have those closet doors with the off white panels. These are the ones that look like fake wood grained contact paper over a wood panel framed in gold metal trim. My wife and I gave our bedroom a face lift recently that included re facing closet doors. We got a whole new look re facing closet doors that we are very pleased with. Basically, we wallpapered the panels. But, in re facing the closet doors, there was more to it than that. First, we had to remove the panels from the guides by lifting up and pulling the bottom out of the tracks. Second, using a electric drill in reverse, I removed all the screws holding the panels in place being careful to place all the screws in one bin. In our case it was an old hat. Then using a hammer and a piece of soft wood, I tapped all the gold metal frames off of the panel. Since the closest doors take up practically the whole length of the wall, they are quite long and somewhat difficult to move around in the bedroom. The ceiling fan got whacked once or twice before I developed a technique that required both a certain movement together with an awareness of space--almost a zen thing. While removing the frames, it may be important to number the parts as you remove them to ensure proper replacement to the right panelswhen re facing the closet doors. I did mine by writing a-1 on the top frame as well as the panel, and then I wrote a-2 on the first side frame, a-3 on the bottom and a-4 for the last or left side. The next door would be the "b" series and so on. When you get to the rollers, be sure to observe how the went in. Some have different mechanisms and require an adjustment or two. 3 rolls of desired wall covering (we used a faux grass burlap texture with greens and browns in it. Our closet doors measured about 133 sq ft--get some extra) See image above. 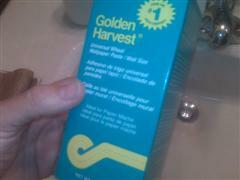 1 box of wallpaper paste (even if you have self-pasting wall covering) I used Golden Harvet because it was inexpensive. Image below. I will have a short TIPS section below after the post. So now we had to prime and paint the frames outside. This was a bit hard, but it was worth it. If you go to an auto body paint store (there is one on Peralta and Fremont you can buy a self etching primer spray). After priming according to directions and painting the frames, we realized that we needed to wall cover the back of the panels, not the front. The paste would work better against the wood back instead of the contact paper fronts. You could peel the contact paper off, but ours was hard to peel and peeled off in little bits at a time. So, wall covering the back it was. We chose to cover the panels after the frames were reassembled. Due to the tight clearances of the frame slots, adhering wall covering all the way to the edge of the wood panel first would create a thicker dimension along the edge, and fitting the frame slot would be difficult over both the wood and the wall covering. When the frames were brought in, it was time to assemble. Assembling the frames on the panels was just a matter of following the letters and numbers mentioned earlier. With a tap here and there being careful not to scratch the frames, the frames were assembled. keep in mind, that if you are reversing the panels, that is covering the back, you will need to place a-2 side frame onto a-4 side panel. Remember you have to reverse. Now with panels done, it is time to cover. But first, do not forget to prime and paint the upper closet door slots attached to the ceiling. Just remove, prime and paint then place back on the ceiling with the screws. Covering the panels, you may find it easier to place the panels on the bed (covered of course) or you can wall cover the panels when they are upright in the slots. It is up to you. I did both. You may want to review wall covering tips on the Internet if you need a refresher course. See TIPS below for a fast list of things to know. Once we had the panels covered, we trimmed the excess and placed them in the upper slots then on the rollers. In short, we transformed our room into something that Martha Stewart would be very proud of I'm sure. I still can not get over the huge contribution the new closet doors made to our redesigned bedroom. I hope you find this post helpful, and please feel free to write with questions or testimonies. Don't forget to "book" your wall coverings--do not rush it. 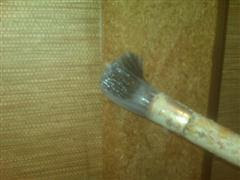 Prime the wood with the box paste according to instructions before you adhere your wallcovering--this will prevent lift up. Do not put seems together, even if you "book" the coverings. Your seems may separate and reveal the wood beneath. Instead overlap by about 3/16ths of an inch depending on your width. Trim wallcovering after it dries not wet. There are many different wall paper resources on the Internet (even though I may disagree on some points) Good luck.